The 4-in-1 tricycle is the ultimate grow-with-me tricycle. it will last for years. Don't hesitate to buy one for your kids! Can be assembles in 4 ways according to your kid's age. Removable canopy for UV protection. High-back seat for comfort and safety. Removable wrap around safety bars. Multi Adjustable Push handle can control tricycle movement. Back Foldable Footrest, Pedals become footrests for early stages. Suitable Age from 10 months to 5 years old. Front Wheel Diameter : 10". Rear wheel Diameter : 8". Weight Capacity : 55 lbs. Weight Capacity of basket : 2.5 lbs. Brand new and high quality. Can be assembles in 4 ways according to your kid's age. Removable canopy for UV protection. High-back seat for comfort and safety. 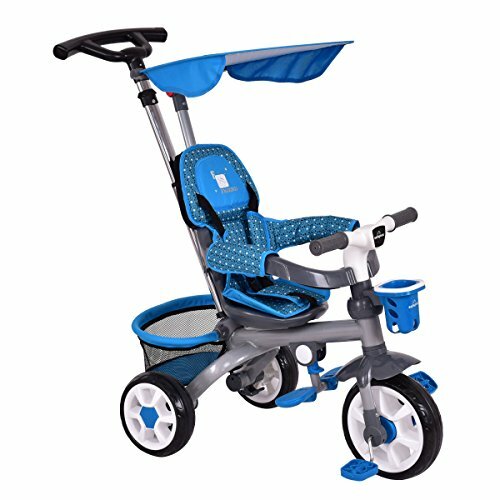 Multi Adjustable Push handle can control tricycle movement.Removable wrap around safety bars. Back Foldable Footrest, Pedals become footrests for early stages. Back storage basket. Features with cup holder. Suitable Age from 10 months to 5 years old. Front Wheel Diameter : 10". Rear wheel Diameter : 8". Weight Capacity : 55 lbs. Weight Capacity of basket : 2.5 lbs. RECEIVE FREE BONUS E-BOOK.